IMAP is a more interactive mail system where the remote mailserver and the local mail client (on your computer e.g. thunderbird, outlook, mail) communicate with each other. If you are simply managing a couple of email accounts and access them from, perhaps, a single computer and possibly a mobile device, PO3 will be more than enough for your needs. There is extra complexity iin the IMAP setup and management which will probably not be worth the effort. We do not recommend using IMAP unless you have specific use for the extra functionality. See the POP3 set up here. 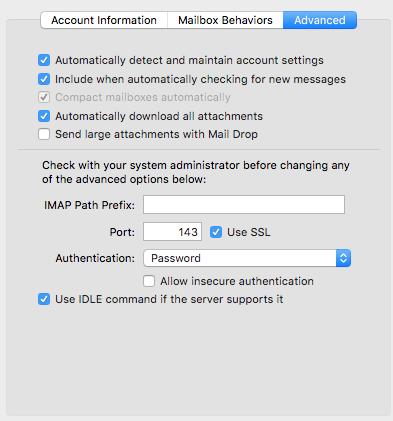 If you demand more from your email or perhaps have used IMAP extensively in the past, use the instructions below to set up your email account in IMAP. Email Address: (doubles as username - use full address). Password : (Available in Global Site Details). Please note: You should use keep your Mac system up to date. 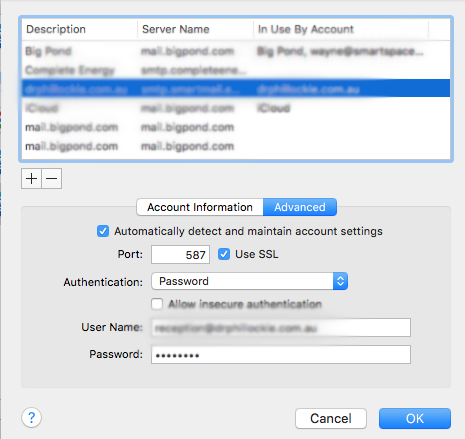 Some older versions of Mac Mail can have problems with secure connections to mail servers. NOTE!! Please use only when you do not have an outgoing server provided by your ISP or if your ISP's server is not secure. Using the outgoing server provided by your ISP will usually provide a more stable/trusted connection less likely to be affected by unusual local factors. Please note!! You must always sign in to the server when sending mail through a Smart Mail mailserver.